This is what I am talking about; cheap tech for the masses that makes lives better in an instant and provides local economy. Not the microwave or a Crock Pot, but the Kyoto Box. John Bohmer's Kyoto Box won the $75,000 Financial Times and HP Climate Change Challenge on April 9th, 2009, thanks to an ultra-cheap and no-brains-needed-simple design. It is brilliant device with the potential to provide cooked food and clean water to billions. 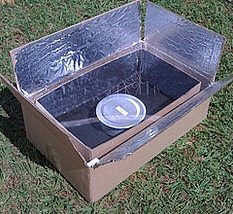 The $5 solar-powered invention consists of a black inner cardboard box and a silver foil-covered outer box that concentrate enough heat to cook food and boil water. Bohmer's invention could be a major upgrade for the two billion people that still use CO2-emitting firewood as fuel. The Norwegian-born inventor's box has entered into production mode in Nairobi, Kenya factory with the capacity to produce 2.5 million boxes each month. Mr. Bohmer envisions the mass production of an equally cheap version of the Kyoto Box made from recycled plastic. Even better, what if this pocket size cooker would be eligible for carbon credits? Ok, we might be pushing it. But still an option, no? Other finalists in the Financial Times competition include Carbonscape (an industrial microwave that "fixes" carbon sucked out of the atmosphere), Mootral (a feed additive for cows that curbs methane production), and Evaporating Tiles (an indoor cooling system that evaporates water within hollow tiles). Ultimately, the box won out because of its potential for cheap mass manufacturing and the ability to affect billions of lives. Funny, how this little box can make such a big movement on our priorities. We have billions of people on this planet without access to food, clothes and clean drinking water, and all it takes is a $5 invention and an entry into a contest to open people’s eyes. Again for all you Gen Xers and Boomers – GET REAL! Get off your couch and begin to see the big picture. Who cares about your 401K or townhouse? We have access to top scientific talent and all we end up doing is pushing paperwork and protocol. We all need to seriously reconsider what the “new” $5 investment is nowadays! this is awesome and reminds me of the "solar oven" i made in 5th grade that semi-successfully cooked hotdogs.